Feeding a newborn baby, while there are some challenges, is relatively straightforward. You have the choice to either breast or bottle feed, and both feeding systems will keep your baby growing and healthy. But then, around six months, you can start introducing solids, and hoooo boy is that another can of worms! It’s best to start with some sort of cereal, but you might be wondering: what is the best oatmeal cereal for baby to eat? Well, I certainly am glad that you asked! Because I asked myself the same question when my first was ready for solids. I have put together a list of the very best oatmeal cereals out there to make your job a bit easier. I’ll also guide you through everything that you need to know in order to make the right choice for your little one. Let’s get to it! Though oatmeal might seem straightforward, there are two different types that you should be aware of, depending on your child’s age. Powder – Most of the types of oatmeal out there for younger babies is going to come in a powdered form. This allows you to mix it to whatever consistency that you wish, whether your child needs it to be thin and watery or can handle something a bit thicker. An older child can eat this type as well, but be sure to make it more on the thicker side so that it has more substance for them to enjoy. Ready-made – Ready-made oatmeal is for an older baby, and would certainly not be my first choice for a young baby’s first food. This type of oatmeal will usually be mixed with some other types of food, which is another reason to keep it away as a first food since you don’t really know what will agree with your baby’s system when they first start eating. Why Oatmeal As A First Food? Like I said earlier on, oatmeal is an ideal first food for a variety of reasons. First off, you can control the consistency as long as you get a powder. This allows you to make it super easy for your little one to not only take into their mouth but to swallow with ease. Secondly, since your baby has up to this point only been getting breast milk or formula for their nourishment, you don’t know if they have any types of food allergies. Oatmeal is gluten-free and relatively bland, making it a perfect choice for you and your child to practice the act of eating without having to worry about any allergic reactions. DHA – Docosahexaenoic acid or DHA as it is more commonly known as an Omega fatty acid that is added to some kinds of oatmeal for babies. The reason that you might want to have this in your oatmeal is that it has been linked in multiple studies with cognitive developments. Basically, DHA can help your baby’s brain to develop, which is obviously a huge plus. Organic – Some oatmeal is also organic. This means that there are no unnecessary chemicals added to it at any time during the manufacturing process. While most of these chemicals are harmless, you might want to get an organic oatmeal for your child’s first cereal, as this will help to eliminate any chance of a negative reaction to the food. Probiotic – You might also want to look for an oatmeal that has some probiotics added to it. Since this is most likely going to be your baby’s first food, it will be a drastic change for their tiny tummies to handle. Probiotics can help to ease their transition towards solid foods a bit, making them an invaluable addition to any of your kid’s foods. Flavors – If you have an older baby that is an old hand at both oatmeal and other kinds of foods, then you can get oatmeal that has other foods mixed in. This will help to make it more appetizing if you have a picky child. It will also offer you another healthy and delicious meal that you can feed to your little one. This type of oatmeal comes in both pre-made and powdered forms. Mixing Agent – To help your younger baby to handle the new sensation of eating solid food, you might want to mix in some breast milk or some of their formula. This familiar taste will help to signal to them that this is food and that they should take it in their mouths and swallow. Make sure that you look carefully at the label of your oatmeal since some types only work with water instead of the other liquids I mentioned above. Texture – The texture of the oatmeal that you choose for your baby is highly dependent on the type of oatmeal that you select. If you get a powder to mix you can control the consistency, which in turn will control the texture. If, however, you get a pre-made oatmeal be sure that the texture and consistency is something that your kid can handle. Otherwise, you run the risk of them not liking it, or even worse, them gagging on it. The Good: Gerber has long been one of the top brands whose very name is synonymous with quality baby products. This oatmeal, which you can view here, is no exception to this rule. It comes in an easy to mix powdered form, which allows the individual parent to determine the thickness and texture for their infant. This oatmeal is also infused with both DHA and a strain of probiotic. The DHA will help with brain development and cognitive skills, and the probiotics will help to keep your little one’s belly as happy as can be while they adjust to their new food. The Bad: While this is obviously a high-quality oatmeal, the price is a little high when you look at it compared to some others. However, you definitely are getting what you pay for since this oatmeal has both a probiotic and DHA added into it. The Long and Short of It: This is an easy to mix powdered oatmeal that has DHA and a probiotic in it. It is a bit expensive but would make an excellent choice for your baby’s first solid food experience. 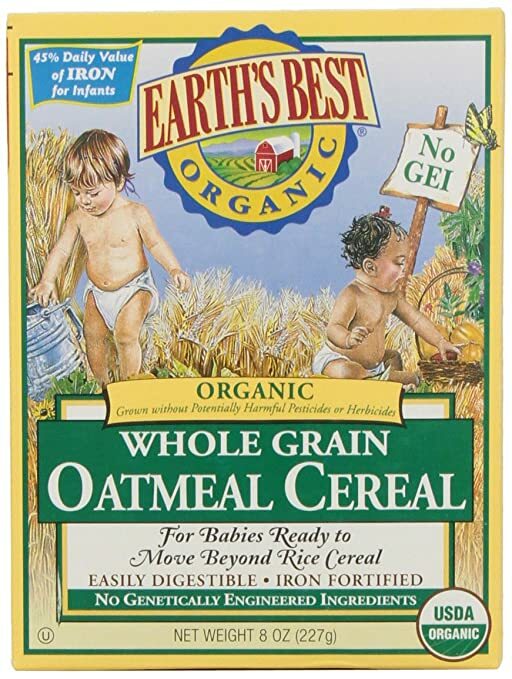 The Good: If you are trying to limit the number of chemicals in your baby’s food, then this is the oatmeal for you! It is again from Gerber and is completely organic. That means, of course, that it has not been processed or had a bunch of different additives put into it while it was manufactured. This helps to make it a smart and healthy choice for your little bundle of love. 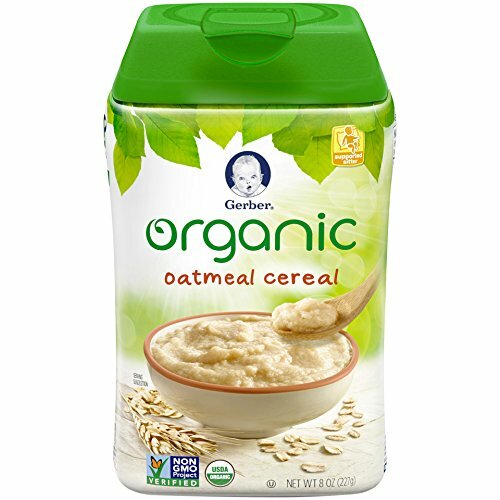 The Bad: Gerber’s Organic oatmeal is a high-quality product which your baby is sure to love. However, there isn’t too much of it to love at a time, since the package is really small. While this will save you money if you try it and your little doesn’t love it, it could end up being a big hassle if your child really enjoys it. You’ll find yourself having to reorder or repurchase it extraordinarily often. The Long and Short of It: This organic oatmeal, which you can view here, is a great way to keep your kid from ingesting any chemicals. The package size is a bit on the small side, but this is definitely worth checking out. The Good: Well, now that I’ve told you about a probiotic oatmeal and an organic oatmeal, how about we switch gears a bit and focus on a probiotic organic oatmeal! 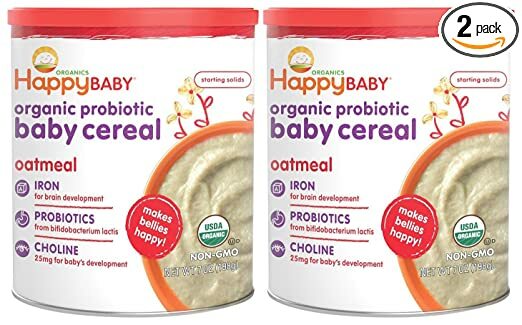 This cereal from Happy Baby, which you can view here, comes in a nice big container and has a probiotic to help keep your kid’s tummy feeling terrific as they transition to table foods. Since it is organic, you can also rest assured that there aren’t a bunch of nasty chemicals added to it either. The Bad: Out of all the different oatmeal that I looked into, this one was the toughest to get to the right consistency. If you overdo it just a little bit when you are adding your liquid, you will get extremely runny oatmeal. However, if you don’t add enough, you’ll be stuck with something way to clumpy for new eaters. The Long and Short of It: This oatmeal, while a bit finicky when it comes to consistency, is totally organic and has a probiotic. It would be good for an older baby that can deal with changes in the consistency of the food that they eat. The Good: If you are in search of oatmeal for your experienced eater, then you should totally check these out! This variety pack of oatmeal comes mixed with other types of food to give your kid a bit of variety in their diet, which they are sure to love. The Bad: This oatmeal pack would, unfortunately, not be a good choice for a first food. While the oatmeal itself isn’t an issue, the fact that you can’t get it without any other types of food added to make this cereal only appropriate for an older, and more experienced eater. 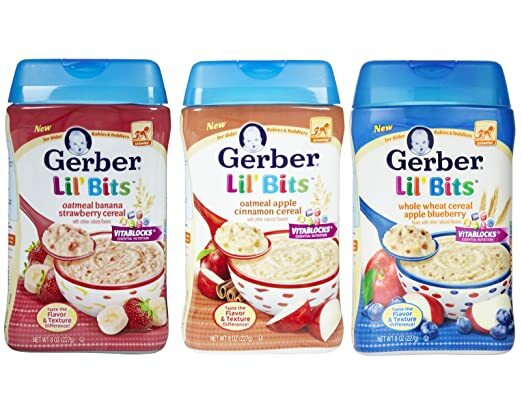 The Long and Short of It: While this oatmeal is a great product for an older baby, the addition of other foods make unusable as a first baby food. The Bad: The texture on this cereal is a bit coarser than the others on this list, which might make it a little difficult for a younger child to handle. Of course, you can always water it down, but that can only do so much. The Long and Short of It: This oatmeal, which you can view here, would work best for an older baby that is ready to transition to foods with more texture. 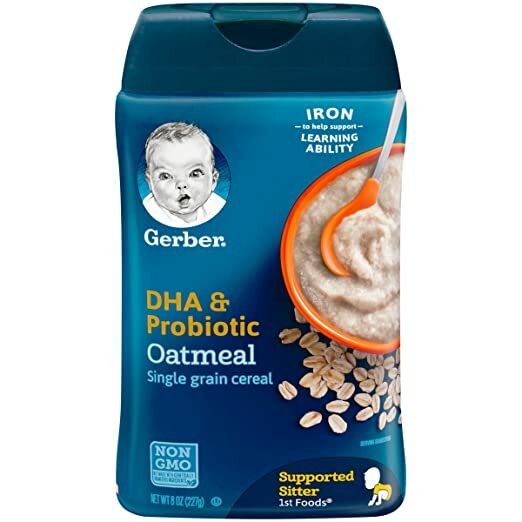 After trying out all of these delicious oatmeal options, I have concluded that the Gerber Baby Cereal DHA and Probiotic Oatmeal Baby Cereal is going to be your best oatmeal cereal for baby out there. I highly recommend that you check it out whether you are looking for your baby’s first food or their fiftieth! I hope that you have enjoyed reading this little article as much as I enjoyed writing (and taste testing for) it as I did. Hopefully, you’ll be able to find a delicious oatmeal that your little one will love now. If you have any questions, comments, suggestions, please let me know in the comments section below. Have a great day!